Now being called the Tour de Crash the 9th stage saw the worst of it. On the fast descent of the the Pas de Peyrol (Puy Mary) there was a large crash with riders going into a ditch on the left and down an embankment into the woods on the right. Forced to abandon after this crash were Jurgen Van den Broeck, GC leader for Omega Pharma-Lotto and teammate Fredrik Willems, who both broke a collar bone; Astana leader Alexandre Vinokourov, who had to be carried up the embankment by his teammates, broke an elbow and his femur; and Garmin-Cervélo's Dave Zabriskie, who broke a wrist. The peloton reached an agreement to slow to allow riders in the crash to return to the peloton which allowed a breakway group to gain more time. In a bizarre accident, with 36 km to go, in the breakaway group of Thomas Voeckler (Europcar), Juan Antonio Flecha (Sky), Johnny Hoogerland (Vacansoleil-DCM), Sandy Casar (Francaise des Jeux), and Luis Leon Sanchez (Rabobank) Flecha was struck by an French television car that veered to avoid a tree on the edge of the road. 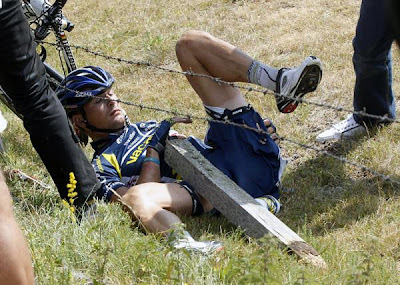 Flecha struck Voeckler, who managed to stay upright, but took out Hoogerland who landed on a barbed wire fence. 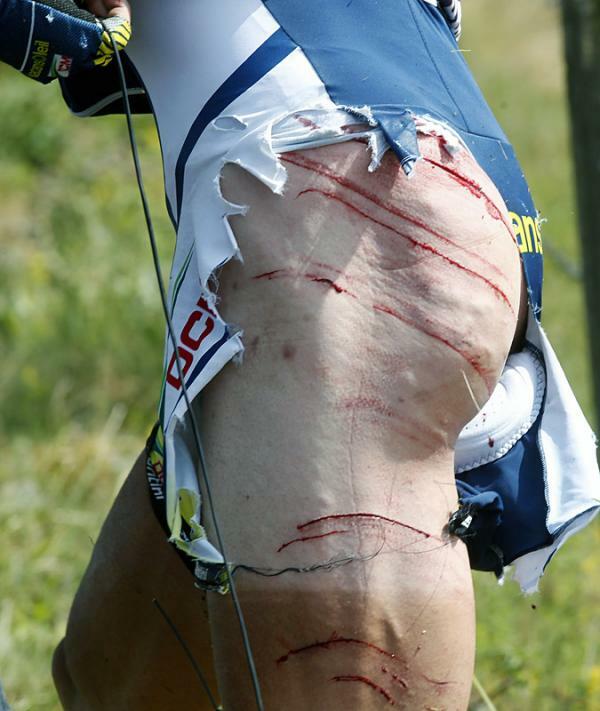 Flecha was able to get up quickly and continue while Hoogerland required medical attention before he could resume. Hoogerland was leading the polka dot jersey competition on the road so only by finishing the stage could he claim it. Voeckler, Casar, and Sanchez waited for a time and then resumed their breakaway pace. Sanchez won the stage and Voeckler took the yellow jersey and now holds a lead over Sanchez by 1:49 and Cadel Evans by 2:26. I can not beleive that.